Sansepolcro is located up in the Apennine Mountains and is the starting place of our 2018 Italy adventure! 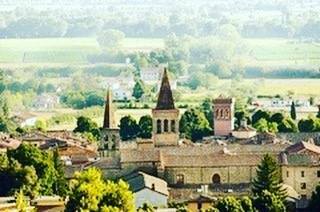 Sansepolcro, was founded in the 11th century and is located in the eastern part of the Province of Arezzo, in the region of Tuscany. It is the birthplace of a number of painters, namely Piero della Francesca (Resurrection), Raffaellino del Colle (a pupil of Raphael), and Angiola Tricca (Italian caricaturist), and the Italian mathematician, Luca Pacioli (‘The father of Accounting’). Currently, Sansepolcro’s economy is reliant upon agriculture, industrial manufacturing, food processing and pharmaceuticals. Tourist highlights include a visit to the Museo Civico and the Sansepolcro Cathedral. Traditionally, the foundation of the town occurred through two 9th century pilgrims returning to the region after travelling to the Holy Land, building a chapel dedicated to Saint Leonard. The chapel ruins now lie underneath the current Cathedral of Sansepolcro, founded upon a stone bought from the Church of the Holy Sepulcher in Jerusalem. This soon grew to become the Benedictine Abbey of Sansepolcro. A note from history – this town was saved from destruction when Tony Clarke, a British Royal Horse Artillery Officer, halted the Allied artillery attack, in order to save the famous painting of Piero della Francesca’s ‘Resurrection’.